What if I told you scientific evidence not only suggests no connection between vaccines and autism it also hints there may be no significant increase in autism at all? I have sat back over the last few weeks listening and reading about the heated debate surrounding autism and its drastic increase over the last few decades. I have a back ground in teaching and researching technical problems in social domains (I am a systems engineer by education and experience) so I thought it would be interesting to see what all the fuss is actually about. Throw in that my oldest daughter just finished a heart-warming book report on Temple Grandin and I could not ignore the urge to dig in. Plus, I’m kind of a nerd and like to work with data in my spare time. To keep things scholarly, I will only review significantly cited peer-reviewed papers. I never thought sifting through the technical paperswould lead to such an interesting conclusion: That how we label things can influence how data is viewed and that political correctness isn’t always a bad thing. The once common term, mental retardation, is now viewed by many as offensive and politically incorrect. The medical community agrees and has begun to call conditions by more descriptive diagnosis terms such as intellectual disability, learning disability, cerebral palsy, down syndrome, and autism. For those uninitiated, a significant portion of the population believes that early childhood vaccines, specifically those containing mercury-based preservatives (called thimerosal) are a major contributing and causal factor in autism. In particular, the MMR vaccine, a potent concoction designed to ward off measles, mumps and rubella, is fingered as a major culprit. The reason for this is anecdotally understood. According to standard practice of care, this vaccine is given first at 12-15 months of age and then again at 4 - 6 years of age. This window is also the time when the first symptoms of autism are identified, one of which is regression (losing previously learned speech and social development). It is only natural that our brains, which are wired to find causal relationships even when none exist, would jump to the conclusion that the two (MMR and autism) are related. After all, a parent witnesses symptoms (I might add tragically), like regression, around the time when the shots are administered. It’s worth a quick review as to the genesis of this belief. In 1999 the California Department of Developmental Services published a report that indicated a drastic rise in the incidence of autism . This was followed by a flood of media connecting this increase to the use of the MMR vaccine (inintially suggested by a UK research group). However, a creadible link has never been found . To be fair, some studies have been published, but they are very low quality and easily discredited . However, the damage was done. Today ~8-10% of children under 35 months old in the United States are not vaccinated with the MMR. Some parents have legitimate reasons, but many self exclude due to the fear of inflicting autism on their children. This interactive map shows which states have the highest rates of non-MMR vaccinated children. This chart shows the percentage (reported as decimal), by state, of children (below 35 months) not given the MMR shot. The first thing that strikes me, or anyone paying attention, is that both sides of the argument claim to be on a firm scientific foundation. But on social media I rarely see any actual science being cited. So I thought it was worth a look. Basically, spoiler alert, there is no statistical link between MMR and autism . However, children receive an enormous amount of vaccines (not just MMR) and the body is a complex system. It seems reasonable to be skeptical of pumping large amounts of these things into our children. The medical profession should preemptively prove the safety of its practices and not push that responsibility on the patients it serves. I have vivid memories of my kids coming home from a single visit with up to six bandages from all their shots. Perhaps in the long-run, with more data, a clear picture of the non-linear impact of this practice will emerge. But the fact remains that for now, no linear connection has been made. So if diagnostic substitution is the artificial cause of rising autism rates then what did we call autism in the past? We used to use a very politically and socially charged term “mental retardation” referred to in scientific journals as simply MR. A number of studies have shown a direct significant correlation with an increase in diagnosed autism and a decrease in diagnosed MR . However, why this term? The answer lies in the system of diagnosis. A doctor cannot, if they want to keep their license, give out diagnosis that are not adopted by the greater medical community. Typically, conditions are catalogued and indexed by different areas in the medical profession. The governing and authoritative document for diagnosis of mental disorders is the DSM (Diagnostic and Statistical Manual of Mental Disorders). The DSM has undergone continuous updating since its original publishing in 1952. There are 5 major versions with several intermittent updates. If you or your child were to be diagnosed with a mental disorder, it would come from the DSM. The problem is that the manual has undergone enormous changes in the last 50 years. The diagnosis terms are, in part, a product of societal changes. In fact through the second and third version (70’s and 80’s), homosexual and transsexual identity were included as disorders. The diagnosis in the early version were very broad and included only a few major categories. Todays DSM is a detailed tome that bears little resemblance to its earlier versions. 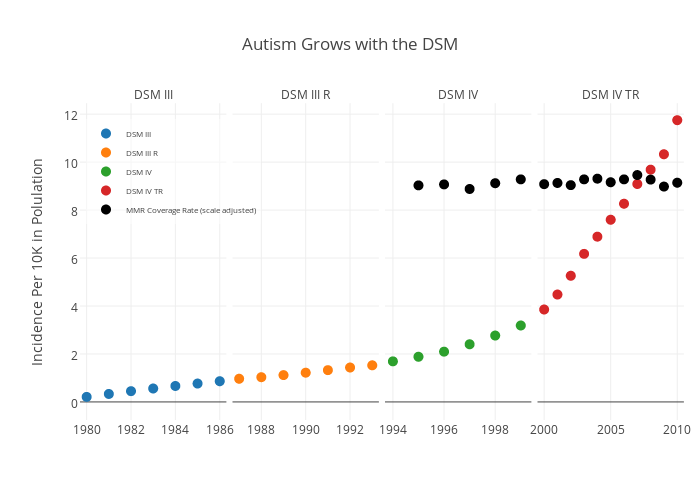 The following interactive chart shows the increase in autism cases with the publication of the DSM versions. This chart is based on the same data from California regional medical centers that set off the vaccine debate. I have added a few reference points on this graph to make my point. The first is I've segmented incidence by year and publication horizons of the DSM. I have also included data (black dots) on MMR coverage rates (normalized for the scale) in California. As you can see, as new and more expansive versions of the DSM are published, the more cases of autism are identified. Particularly this last decade when Autism Spectrum Disorder (a very broad definition) was included. This upward trend is in spite of stable MMR coverage. There are two perspectives on this. The good news is that we are now correctly identifying conditions that would be mislabeled in the past as mental retardation. The second, is that the perception of this growth is likely leading to other conditions being mislabeled as autism. Of interesting note is that a recent announcement by the DSM committee detailing the reduction in scope of the ASD diagnosis . If my hypothesis is correct, this will lead to a leveling off or reduction in the "incidence" of autism in the coming years. In all, this was an interesting effort, let me know what you think.